I recently read this article “Sitting Is the Smoking of Our Generation” from Harvard Business Review Blog recently. And I couldn’t agree more. Like many, I spend long hours at the desk ‘sitting’. I sometimes sit all my eight hours of work in the office chair (not even a fancy ergonomic one) working through lunch until I go home. When this happens, which is often, it really doesn’t help my productivity nor my mood. My mind fears to take a break once I am glued to the computer screen although I also know in full that it is counter-productive. My Outlook keeps beeping every five minutes with new emails. My calendar shows a series of meetings. I become a slave to the computer and the office chair everyday. So when I read this, I thought I need to take an action to break this habit for real. As we work, we sit more than we do anything else. We’re averaging 9.3 hours a day, compared to 7.7 hours of sleeping. Sitting is so prevalent and so pervasive that we don’t even question how much we’re doing it. And, everyone else is doing it also, so it doesn’t even occur to us that it’s not okay. …… Of course, health studies conclude that people should sit less, and get up and move around. After 1 hour of sitting, the production of enzymes that burn fat declines by as much as 90%. Extended sitting slows the body’s metabolism affecting things like (good cholesterol) HDL levels in our bodies. Research shows that this lack of physical activity is directly tied to 6% of the impact for heart diseases, 7% for type 2 diabetes, and 10% for breast cancer, or colon cancer. You might already know that the death rate associated with obesity in the US is now 35 million. So what can I do? Here are a few things I did. 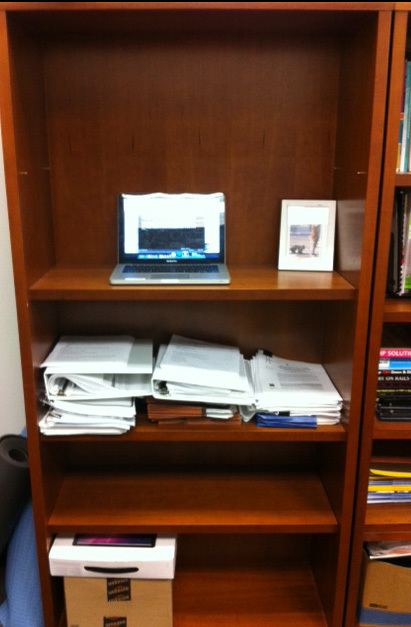 A while ago, I ran into this idea of a standing desk to reduce some of the hours we spend sitting. I can use a laptop at work and I have a bookshelf in my office. So I emptied two top rows of the bookshelf in the office and removed one top shelf. But the problem was I was rarely standing up to even do this. If you don’t get off the chair, there is no way you are going to use this. For this reason, this time around, I also decided to add a timer. When I arrive in the office, I turn this on and set it to ring a bell every 60 minutes during my 8 hours of work. When the bell rings I get up and move around for a few minutes or use a standing desk even if it is only for 10 minutes. I like the sound of the meditation bell. So I use a meditation timer but you can use any timer for this, either on your work computer or on your smartphone. I set the timer program, so that it would run automatically whenever I power up the work laptop. And all I need to do is to just press the start button once a day. Easy! Lastly, I turned off my new e-mail notification in my work e-mail. The frequent beep from my email has been always breaking my concentration and I realized that I am most productive if I can just do work without checking my emails. But like many people, I could not habituate myself to check work e-mails only two or three times a day and people often expected my replies in an hour or less. But by turning off the notification sound, at least I was not being interrupted when I was in the middle of doing something. These three simple things I did – a standing desk, a timer reminder, turning off the new e-mail notification beeping sound -so far have been successful in making me move a bit more and preventing me from sitting for eight hours straight and leaving the office physically miserable and mentally tired at the end of the day. If you have any other simple tricks that work well to make you sit less and move more during your office hours, please share in the comments!